ProSnooper is a program for the computer game Worms: Armageddon. 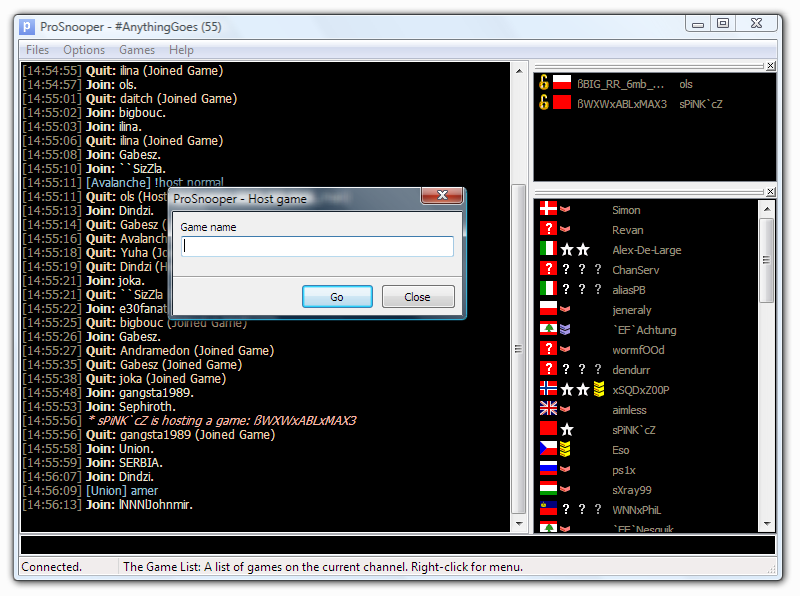 It allows anyone to connect to the "Wormnet" game servers to chat, join and host games. In other words, it acts as a frontend for Worms: Armageddon online play allowing a user to quickly launch ProSnooper to chat and join games without launching the full-screen game menu. ProSnooper even supports minimizing, thereby being able to minimize ProSnooper when doing something else or logging messages while you are away. ProSnooper includes a message log that records private messages and highlights, other users typing your name. ProSnooper is only available with Worms: Armageddon. Unfortunately, the Worms World Party protocol is encrypted and thereby letting out ProSnooper. A "buddylist" that allows you to keep track of your friends and notifies you when they join Wormnet. ProSnooper can still be downloaded from this site, but a new, promising, user-contributed version is under development at SourceForge. You may wish to use that instead; the version here hasn't been updated since 2007. Go to the ProSnooper 2.2.x site. ProSnooper is released under the following license. c) in public, modified packages, the source-code is available. 2. Permission is hereby also granted to distribute binary programs which depend on this package. If the binary program depends on a modified version of this package, you are encouraged to publicly release the modified version of this package. ProSnooper Lite is released under public domain.